2016 two CD set. 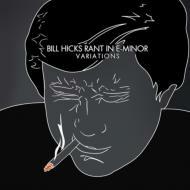 Rant In E-Minor: Variations is Bill Hicks' most brilliant album in it's raw form with no music interludes. The original release was compiled from multiple shows in Austin, Texas and other locations; this version is one of those Austin evenings, October 24th, 1993. It contains Hicks' classic material, never-before-heard bits, and some new twists on some of everyone's favorites. Bill Hicks was an American stand-up comedian, social critic, satirist, and musician. His material, encompassing a wide range of social issues including religion, politics, and philosophy, was controversial, and often steeped in dark comedy. He criticized consumerism, superficiality and banality within the media and popular culture, which he characterized as oppressive tools of the ruling class that keep people stupid and apathetic. Hicks died of pancreatic cancer on February 26, 1994 in Little Rock, Arkansas, at the age of 32. In subsequent years his work gained a significant measure of acclaim in creative circles-particularly after a series of posthumous album releases.